If you read through Trevor’s and my coverage of Winter Jam a few weeks ago, you may remember a certain odd-ball car in a sea of Nissan S13s and BMW E36s. No, not the ’80s Thunderbird, Mitsubishi Starion, or even the SRT-10 Dodge Viper. 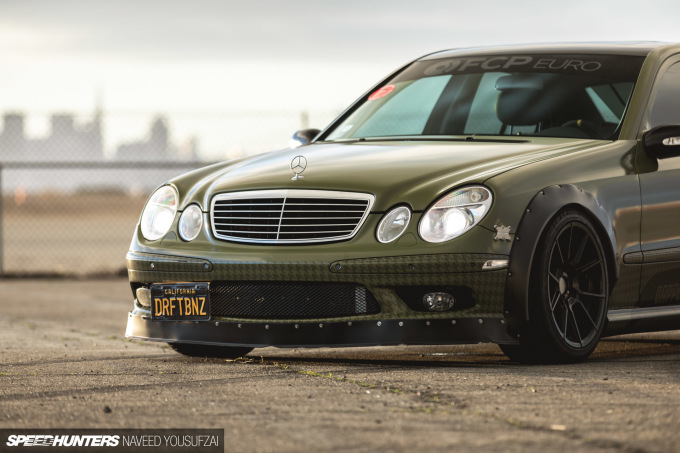 Don’t get me wrong – those cars were rad, but the one that really caught my eye was this Mercedes-Benz E55 AMG, known as Dapper Drift and piloted by Denis Ivanov of Oakland, California. Denis’s family immigrated to the US many years ago from Russia, and like many of us, faced hardship in finding success within the ‘American Dream’ narrative. 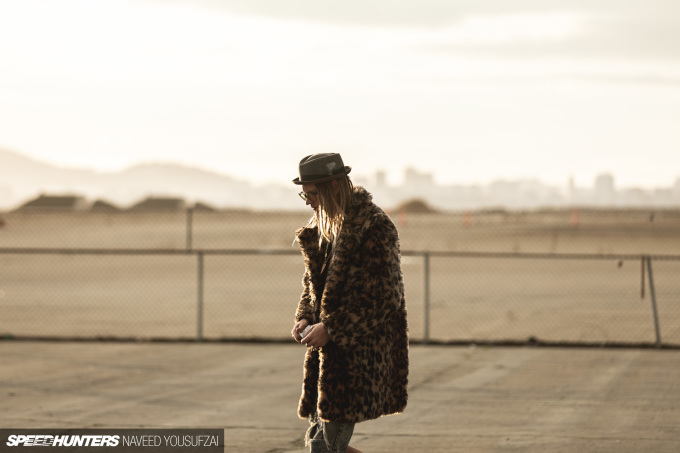 It was early on in his childhood when he realized that he was fascinated with anything that was motorized and mechanical, which ultimately led him to his infatuation with cars. 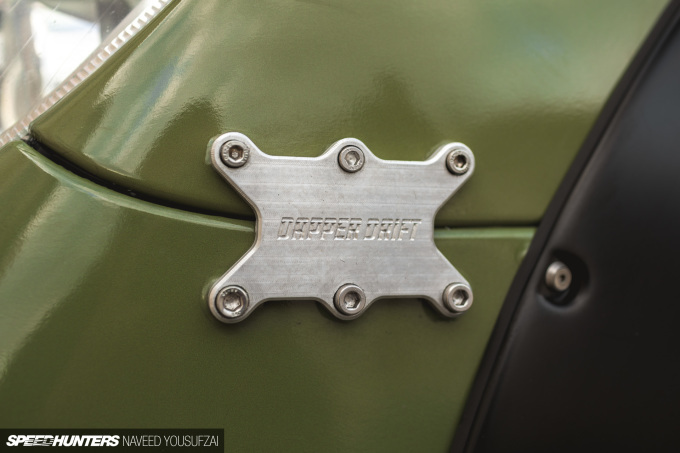 He started out with building an E36 BMW, but eventually scrapped that project after meeting his now best friend Scott Drozd, who just so happened to be the founder of FCP Euro. 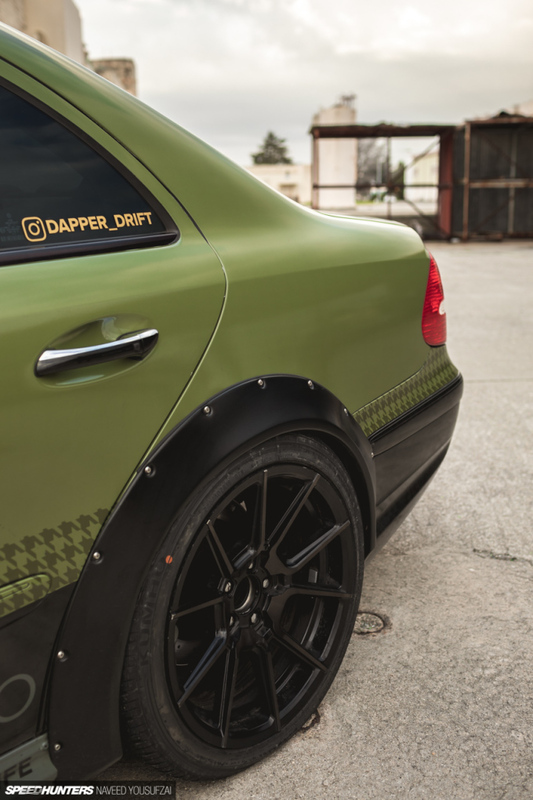 Shortly after their friendship formed, Scott saw Denis’s eccentric taste and reached out offering a partnership program, which in turn led to what is now Dapper Drift. 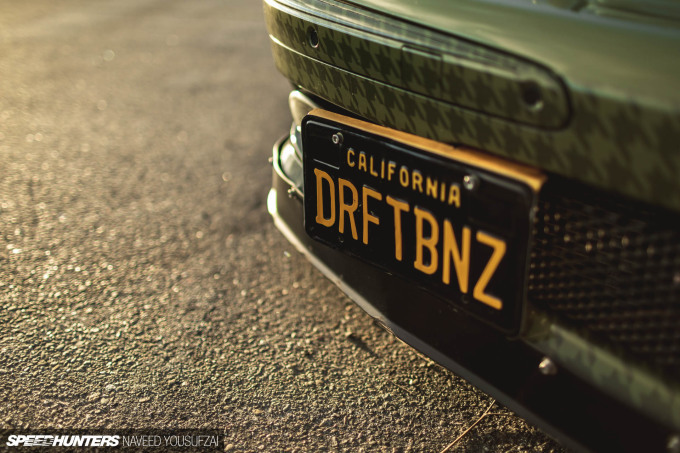 With a big name and close friend supporting Denis, he set out on his venture of creating one of the most obscure and oxymoronic drift cars in the scene. 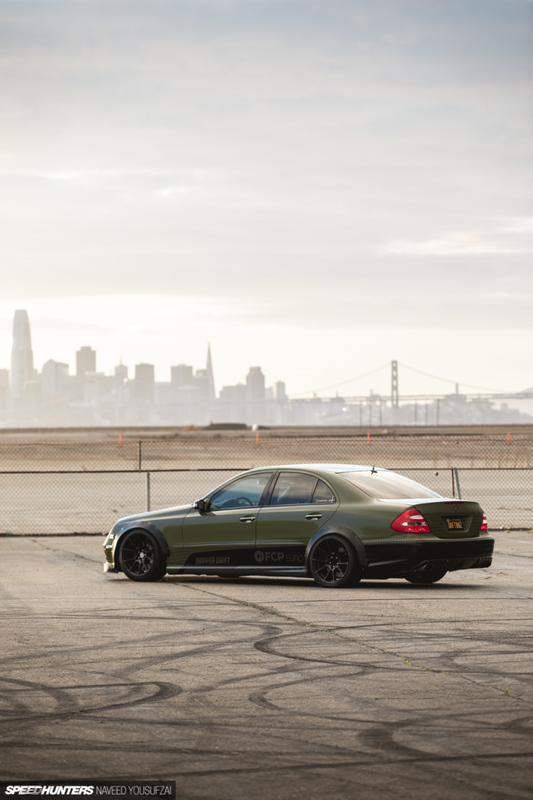 The car started out as a fully optioned 2003 Mercedes-Benz E55 AMG, factory equipped with features like electronically-controlled rear shading, heated and cooled seats, Parktronic parking aids, and of course the monster 469hp M113K supercharged V8 engine. Despite being totally equipped with comfort-oriented technology, these were considered the fastest production sedans of the era, and they still manage to hold decent value today. So why in the world would anyone want to turn one of these into a drift car in the first place? And he’s not lying. When you really start to get into modifying these cars, let alone to a drift specification, you are pretty much forced to either Frankenstein bits and pieces from other cars together or develop the parts from scratch; there is no aftermarket support for this type of motorsport in the Mercedes-Benz dictionary. 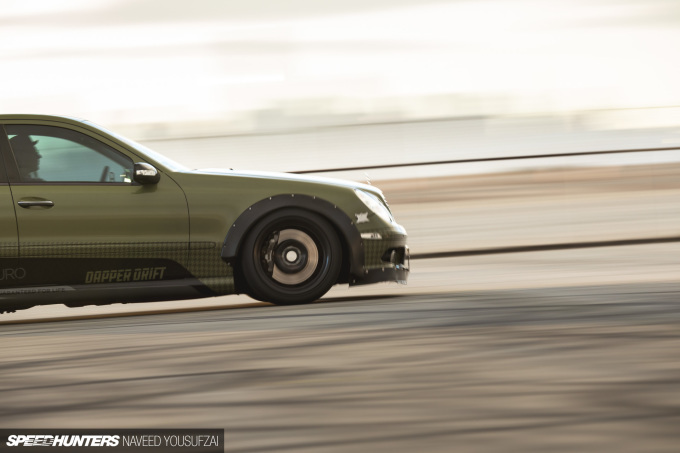 Luckily for the purists though, Denis’s vision did not entail a full drift-track-ready race car, but instead, a true homage to retaining the dapper in the name Dapper Drift. Surely Denis could’ve resorted to gutting the E55 entirely, fabricating all sorts of suspension bits and aero, and swapping in a crazy sequential gearbox to really get the car up to the competitive level. But instead, the Mercedes remains subtle, retaining every bit of equipment that was installed at factory, including the ABS and traction control systems. 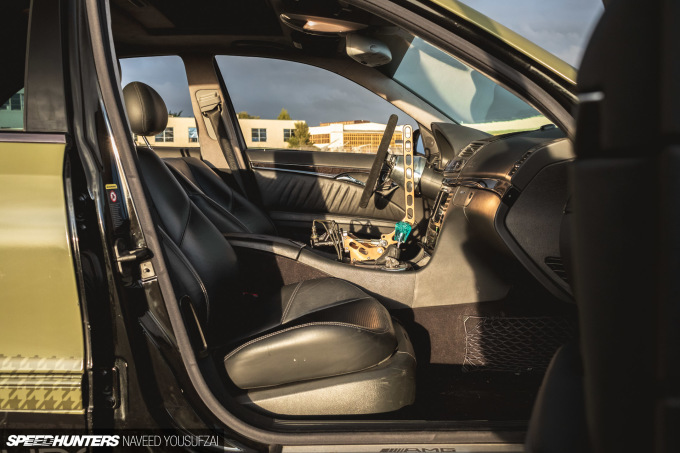 Though the car does have many modifications, there are a few significant pieces that I found intriguing, including the steering wheel hub, the steering wheel itself, and the hydraulic braking system. As mentioned prior, Denis had to resort to making many of the parts himself, and the first piece was the one-off hub adapter, which was milled from a solid piece of aluminum. This hub still uses the factory steering wheel spline core, which is press-fitted to the backside with a centering pin and a clamping diameter ring. A rather complex design for an otherwise simple steering wheel hub. Because these cars weren’t offered with a manual transmission, there really aren’t many options for conversions, so Denis decided to keep the automatic. After all, this is the same Speedshift 5G-Tronic 722 used in the twin-turbo V12 S600 of the time, which boasted something along the realms of 1000Nm of torque from the factory. In theory, the transmission should hold up fine, and so far it has. 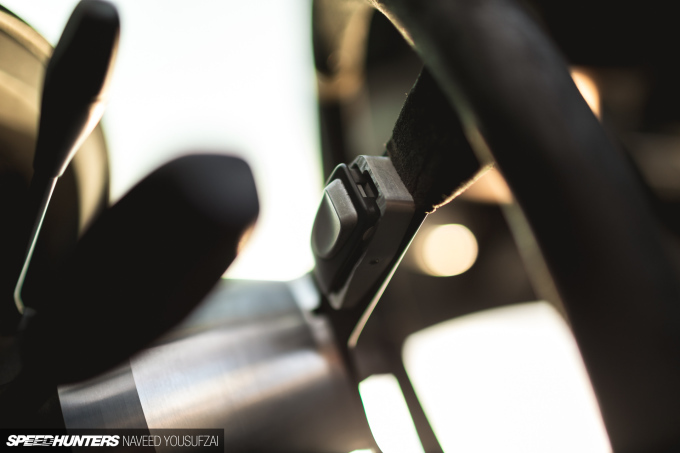 But what’s really neat is that Denis went far enough to CNC factory-styled shift buttons mounted to the back side of the Momo Mod.07 steering wheel to utilize hand shifting without getting in the way of the hydraulic brake lever. It’s a clever setup, and you wouldn’t notice it’s even there unless you went looking for it. 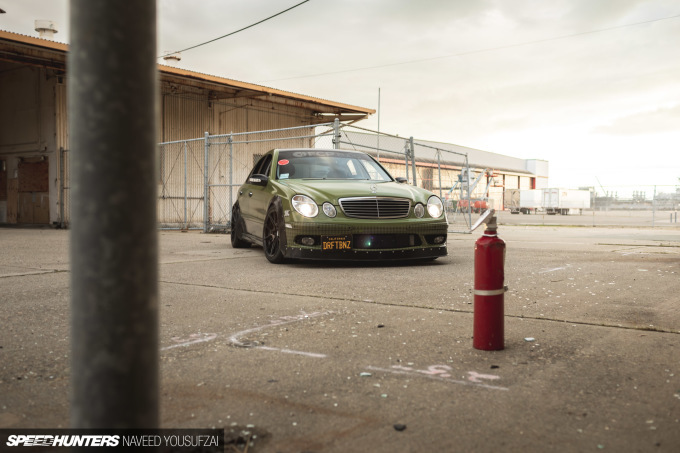 As many will know, E55s are fitted with loads of electronics to help stabilize the car and keep things oriented (or disoriented – AMG owners know what I mean) when driving at its limits. 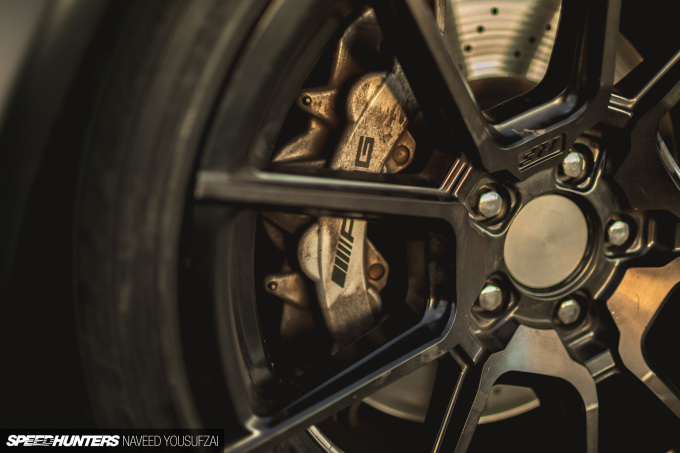 ABS is key to the car’s traction system, so getting rid of it would deter too far from the dapper theme. Instead, Denis fitted a pass-through dual master cylinder from Wilwood, with a rear hydraulic brake that’s been pieced together from a few aftermarket hydraulic brake setups, as well as milling some custom pieces for the tunnel mount to adapt it to two separate master cylinders instead of one. So in essence, Denis has the ability to turn all traction and ABS software off with the flip of a switch, which then allows him to utilize the hydraulic brake setup. Then when he’s done sliding around, he just reverts it back to its factory setting. It’s honestly one of the most overthought designs I’ve seen, but hey, you have to pay to play, right? 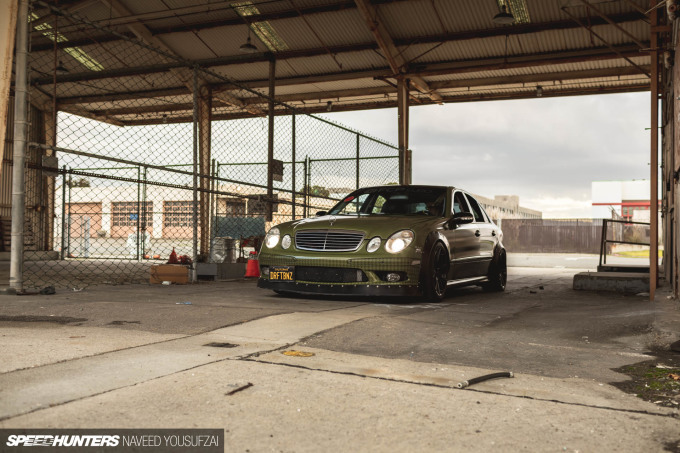 It’s safe to say, a lot of time and effort has been put into this E55. Going that far probably would’ve been enough for most to call it quits and divert to a more supported platform, but Denis wasn’t having any of it. 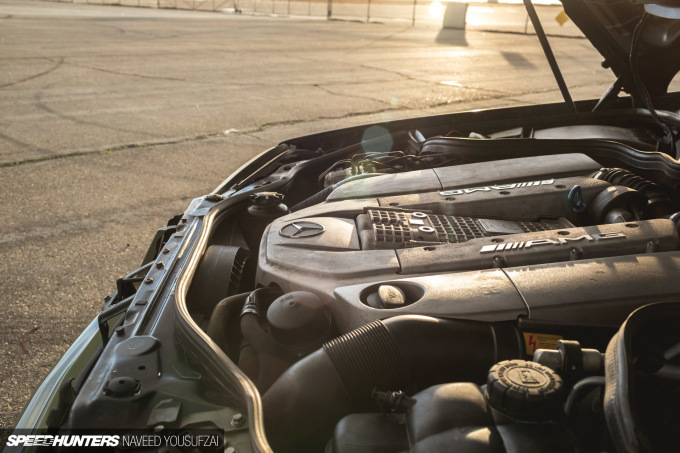 He continued on his conquest and equipped the car with KW Variant 2 coilovers, a larger HAG215 limited-slip differential, a 2-liter dual-pass front-mount heat exchanger, 18×9.5-inch TSW Chrono wheels, and some modest custom-made flares and a front lip. Everything on this car was designed and thought out with as little compromise as possible. Is it the most competitive drift car on the course? Probably not. I mean, it still retains factory steering angle. But that wasn’t the ethos of this build. Instead, it’s a fully legal street car, and totally daily drivable as it sits, which is what I find most unique about it. There’s a great deal of craftsmanship incorporated in the build process, and that’s not something you see on the average amateur drift car. Denis, with the help of FCP Euro, has successfully managed to develop one of the most unique and well-sorted cars you’ll find out on the course. And after a day at the track, you’ll catch him on the highway, A/C blasting, seats warming up, and electric curtains rolled up, coasting home in executive-level comfort. How often can someone say they can do that? 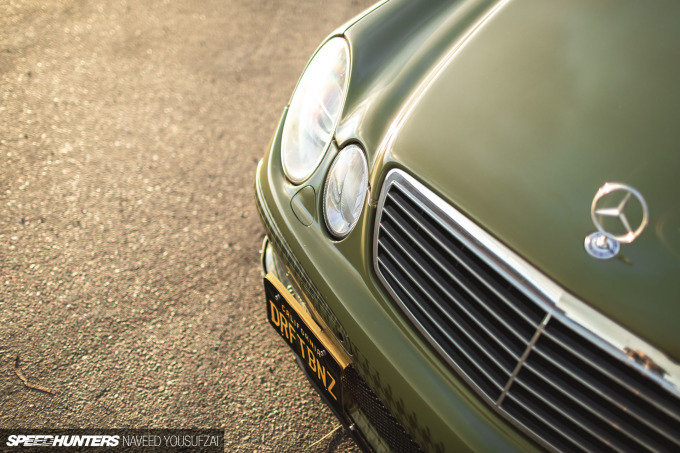 Completion of this E55 has come and gone, and with that means time for a new build. This car will be making its way back towards the East Coast to be displayed at the FCP Euro facility, where they will show it to the public as well as take it out to a few events every now and then. 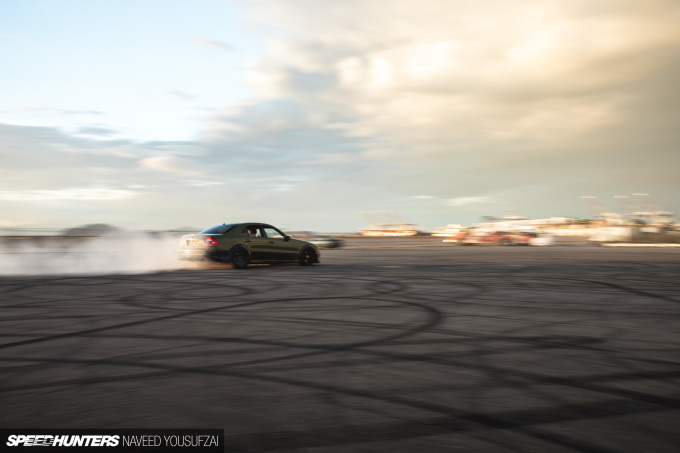 Denis is planning a return with something a little more drift-centric and conventional, but with his own flavor and twist applied to it. I have a strong feeling it will be another European car, but until that project is done, I’ll leave you guys to drool at the most elegant drift car on the course.